As reunion events for families split between the United States and Mexico at San Diego’s Friendship Park will continue being banned this year, dozens of people who yearned to hold their loved ones – even if just for a minute – traveled over 1,000 miles to Texas just to have that fleeting moment with their family members. The city of El Paso, Texas witnessed the excitement, longing, and tears of nearly 300 families as walls and borders gave way to face-to-face encounters and loving embraces during the fifth “Hugs, Not Walls” event organized by the Border Network for Human Rights and Border Angels to allow immigrants to briefly reunite with their loved ones. 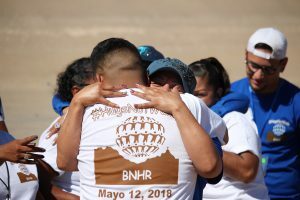 “It was very powerful; we felt all the emotion, but also a lot of sadness, because at the end of three short minutes – since the families had to split up again – when they said ‘time’, you could truly see the pain these people were going through,” said Jacqueline Arellano, desert water drop coordinator for Border Angels. In order to get to the meeting point along the Rio Grande, several participants had to travel far along highways near the border and face the growing number of immigration checkpoints, risking direct deportation for being undocumented, all for the opportunity to spend mere minutes with their loved ones. “There are a lot of Border Patrol along the way, so we don’t know if it’s worth it, but that’s up to the person,” said Border Angels Founder Enrique Morones. Immigration advocates who traveled from San Diego were surprised by how few CBP officers they saw. Whereas in California they are near omnipresent, in El Paso they were nearly invisible. “You saw almost no officers, nor security. It was a very organic event, and that goes to show that militarizing our border is a way to convey the message that this security is needed, because the people south of the border could be dangerous,” added Arellano. 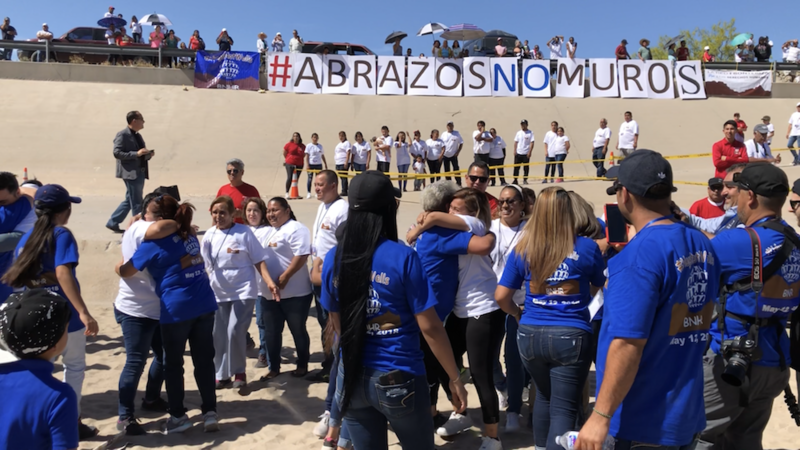 The next “Hugs, Not Walls” event is scheduled for October 2018, once again in El Paso. “It’s difficult, because we do send people over there. 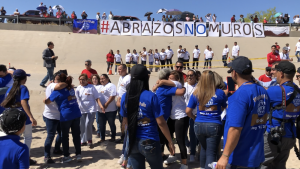 So, for those people who contacted us because they wanted to do it on [Mexico’s] Children’s Day, it is very important that they get in touch with Border Angels if they want to go, so we can put them in contact with the Texas group,” said Morones. As far as cross-border activities in San Diego, they are hoping to have a binational religious celebration in June. Although people would not be able to hold each other or have any physical contact, they could see each other and, perhaps, exchange a few words through the bars that divide the border between San Diego and Tijuana. For additional information regarding the “Hugs, Not Walls” project, please contact Border Angels at: (619) 487-0249.